How old were you when you first started skiing? I was just three years old when I put my first skis on. How often do you ski during the ski season? During the ski season, I ski every single weekend and during every school vacations I have. Any time I can, I ski. Who taught you to ski? I had my first ski lessons with ESS Crans-Montana. What are you favorite type of ski races (slalom, giant slalom, etc.)? My favorite is giant slalom but I also like "combi-race" which is a mix of giant slalom and slalom. Do you also ski on a local ski club? If so, what one? Yes, I am part of the Ski Club in Crans-Montana in Valais. Is it scary to go fast down the hill? No, it is fun ! What do you find challenging about skiing? What do you find fun about it? I find challenging to walk up the hill - with ski boots on and skis on my back - when I did not properly apply instructions from trainers. I find fun to spend time outside with friends and go down the slopes at very high speed in all kinds of weather conditions. Have you ever had a bad ski accident or crash? If so, tell us about it. Yes, unfortunately, I had a bad ski accident last year. During a race where there was strong wind, icy slope and nul visibility, I lost one ski, fell at full speed with mouth first on the ice and the edge of my ski. I damaged one tooth and deeply cut my both lips. I was scared when I saw all that blood around me in the snow. But with my dad's help, I put on my skis again and went down to the rescue team. I finally ended up at Sion Hospital. The following weekend, I was training again and three weeks later, I raced again on that same slope - with great success! "What does not kill you makes you stronger!" What other big competitions have you raced and what were the results? I do all races organised in Valais with my ski club. Sometimes, I end up on the podium and sometimes not. I also race at the famous Grand-Prix Migros. So far, I was close but never made it to the final (only the first 3 of the races are qualified for the final). I will keep the fingers crossed for this year. 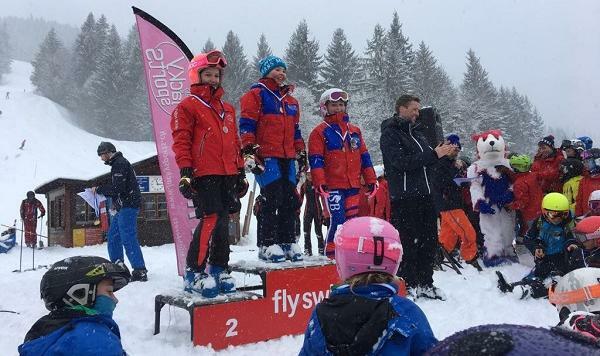 Finally, I raced at the Belgian Ski Championship last year and ended 4th in slalom and 5th in giant. And I will participate again this year aiming for a podium. Who are your skiing inspirations? What are your future goals for skiing? I would love to become a professional skier. 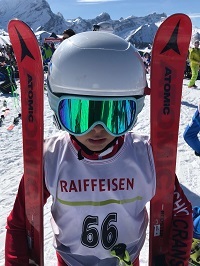 But first, I need to succeed in the admission tests for the Ski Valais team at the end of this season. 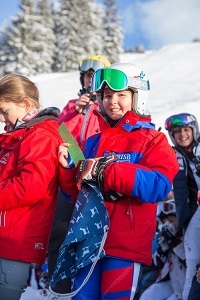 We wish Louise all the best and success in her future ski races!